Nothing gets my heart pumping like spotting an antique “in the wild.” Seeing a piece of the past in its natural habitat, still hanging on after so many decades. Most collectors fantasize about stumbling on some forgotten trove, like Tutankhamun’s tomb, hidden in a shed or barn or basement, untouched since being stashed away. It occasionally happens. But these finds aren’t wild – they’ve already been taken into captivity. Wild antiques are standing proud where they’ve always stood, often still serving their original purpose. Hidden in plain sight. Historic buildings are one example, except that we’re all aware of them. Let me tell you what I’m really talking about. I’m driving down California’s PCH (Pacific Coast Highway) with my dad two years ago. We pull over into a small side road to switch drivers. It’s a remote area. There’s a wooden, barn-like building, boarded up with weeds growing all around it. On the side of the building, totally forgotten, there’s a flanged Sherwin Williams porcelain “Cover the Earth” paint sign. Wow! It’s got some rust and a couple of bullet holes, but there it is, 60 years later. In this age of utilitarian antique malls and online stores, wild antiques are like the coyote who comes out of the woods and howls in our backyard. “I’m still here!” Against all odds. Take a close look in your town. Vintage signs are still ubiquitous in America – porcelain, bronze, neon, signs painted on the sides of brick buildings. Check out the Pittsburgh Signs Project and Historical Marker Database websites – two members of our Hall of Fame – for great examples. Look in your pockets. There are still silver quarters in circulation – not many, like grizzly bears, but they’re out there. Look down at your feet. You’ll see beautiful cast-iron manhole covers of every variety, 100 years old and full of craftsmanship and personality. Still wild. 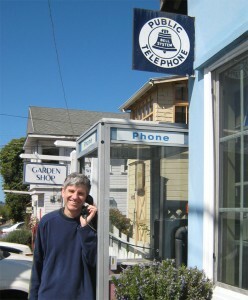 Next on the list – telephone booths. Still everywhere: great wooden ones (call me immediately if you see a walnut one), metal ones built into the lobby of Art Deco buildings, booths in restaurants and gas stations. They’re even having a resurgence because people use them to talk on their cell phones. Speaking of phones, there are dozens of restaurants, dive bars and hole-in-the-wall places in San Francisco which still have old rotary phones hanging on the wall. They still use ’em. Wild. As hard as we try to modernize, wild artifacts are resilient. Train tracks used to crisscross the part of San Francisco where I live and work. It was thick with steam engines and freight from 1906 to the 1950s. Those tracks have been long since paved over. But it didn’t work… the tracks are still there! If you know what to look for, you can see the discoloration of the pavement, the cracking. All the sidings, the curves and switches are in plain sight, if you have some imagination. I love looking at those tracks as I drive into work each day. Wild! What antiques have you seen in the wild lately? Use the comment box below – I’d love to hear about ’em! Until 20 years ago, there were still 2 original 1920’s Auto Club of Southern California mileage signs long the old El Camino Diablo, between Bates Well and Yuma. Those signs served a real purpose. They gave the mileage to the only water sources in many miles. Unfortunately, someone took them. In the same area, along a very isolated road, there used to be a WW II vintage US Army Air Corps Gunnery Range sign. I am afraid to check if it is still there. I hope it is. “ ” Over-the-top luxury went out of fashion in favor of this self-conscious simplicity.